Two months ago, we received our first look at the*Nerf Nitro Bumblebee Speedblast set; a crossover between Nerf and Transformers. 2005 Boards Member Hotconvoy has spotted this new set at United States Retail (Gamestop – Highlands Ranch, Colorado). Bumblebee Speedblast is priced at $29.99 and features a standard*LongShot Nerf Nitro Blaster*with a Bumblebee inspired deco,*Bumblebee, Cliffjumper, and Barricade foam body cars, and*3 stunt pieces*(a Groundbridge, a ramp and a Decepticon barrier). 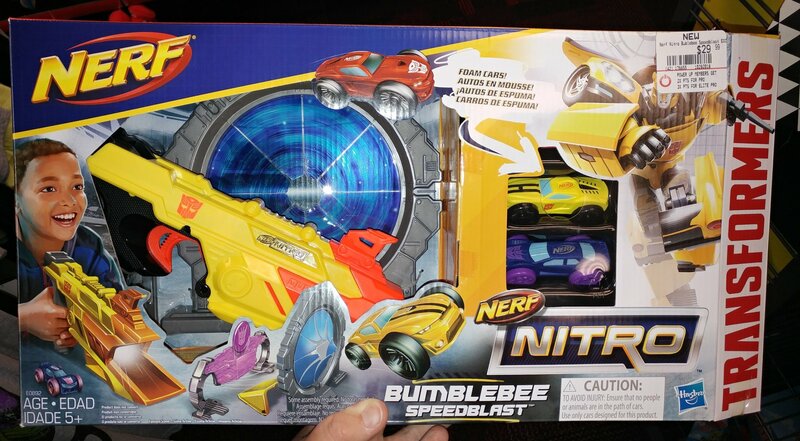 The post Nerf Nitro Bumblebee Speedblast Found At US Retail appeared first on Transformer World 2005 - TFW2005.COM.